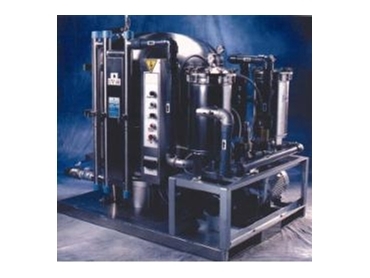 The Wyckomar UV-60, originally developed for use in the military camps related to the UN peace-keeping mission in Bosnia, is an integrated system of quality water purification and disinfection equipment, ready for use anywhere. The Wyckomar UV-60 transportable drinking water system, available from Novasys Group , works as a small-scale water treatment plant, purifying and disinfecting up to 230L per minute of water when certain basic conditions are met. The Wyckomar UV-60 transportable system can be supplied with fully automatic or manual controls and can fill a 200,000 litre storage bladder in 14 hours with less than 4% discharge waste water. Configured with a five stage micro-filtration process, the Wyckomar UV-60 transportable drinking water system removes a wide range of contaminants including heavy-metals, pesticides, parasites and sediments. The system then applies a high-powered UV dose to the water stream to kill bacteria, viruses and spores that may be present. The Wyckomar UV-60 transportable drinking water system delivers at least a 4-log (99.99%) removal of most common bacterial and viral contaminants including E.coli, coliform, polio, cryptosporidium, giardia, tuberculosis, influenza (including avian flu), streptococcus, typhoid, cholera, legionella, anthrax and coxsackie. Custom fabricated for specific application, the Wyckomar UV-60 transportable drinking water system is easy to ship anywhere in the world, economical to use and highly efficient. The system can be used in military camps, disaster relief, small community water systems, remote construction projects and environmental clean-up sites.